However, the most abundant animal life lurks within the water below. A few days ago, while boarding Sea Gem, we saw a shadowy figure hovering just below our hull. At first, we thought it was our keel, but upon closer inspection, we realized the object was actually a massive (100lb +) tarpon. It was a bit unsettling to see such a large fish lingering in the water directly below Sea Gem. Each time we transferred Moishe on/off the boat, I kept envisioning him falling in and being swallowed whole by the mammoth fish. It is hard to appreciate the size of these fish from the picture above, but I can assure you--they are huge. 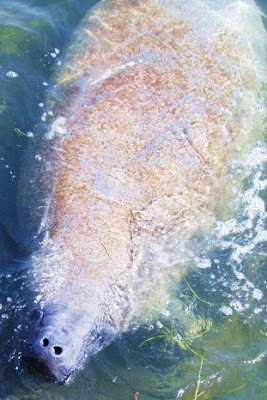 Although we hope the jellyfish masses won't return anytime soon (or ever), we welcome the prospect of a manatee infestation.